Lisle AC/Fuel Line Disconnect Set includes six sizes:, 5/16 in, 3/8 in, 1/2 in, 5/8 in, 3/4 in and 7/8 in. Set helps yo easily disconnects air conditioning lines and quick connect fel lines. 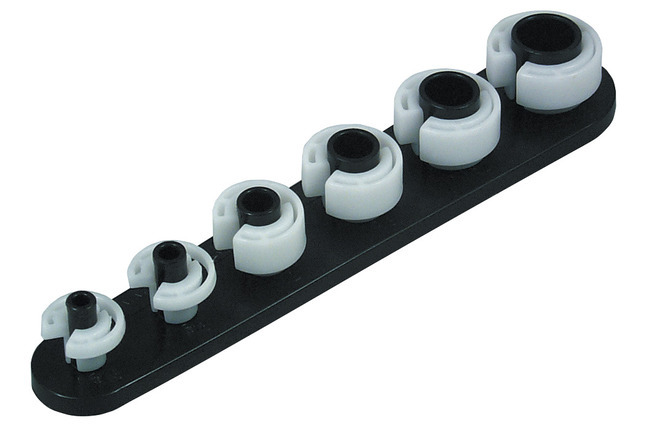 Set contains six tools which disconnect the spring lock couplings on Ford and Chrysler air conditioning line. Easy to use in confined spaces, the tools also work on fuel line quick connect couplings found on GM, Ford and Chrysler. The 5/16 in size fits on push lock connectors found on Ford radiators and transmission lines.